Toms Tile and Grout Cleaning Yallambie offer the best cleaning, repairing and sealing services. Expert Tile Cleaners are ready to help you! Contact us today on 1300 068 194 for same day tile and grout cleaning services. Like any other surface, this area too requires ongoing daily, weekly or monthly maintenance using measures like vacuuming, mopping, scrubbing and sweeping. However, using cleaning techniques like a toothbrush and consumer-grade cleaners and a few hours of labor can’t take you farther. That’s why you need the expert knowledge on Tile and Grout Cleaning and professional tile cleaning services. At Toms Tile Cleaning Yallambie we offer a wide variety of powerful cleaning solutions which is designed in order to remove buildups, spots, soils, oils and stains using high-pressure rinse and extraction in order to leave your tile and grout better. Our Professional tile cleaners and grout cleaning measures won’t take enough time and can clean the tiles and seal them on same day cleaning, and your freshly cleaned floors are then ready to shine. Toms Tile Cleaning and Grout cleaners penetrate deeply into the porous surface of the tile and grout affected and remove the soil which helps them eliminating the mildew, bacteria’s, other contaminants and fungus. Our professional Tile and Grout cleaning methods help in resisting microbial contamination in order to leave the tile and grout clean and healthy as possible. We at Toms Tile Grout Cleaning Yallambie provide not only the best grout cleaner process, but we make sure that the tile cleaning and grout cleaning services we provide are driven by knowledge of professionals so that they can easily identify your needs, and able to opt the proper products and equipment in order to deliver results that are way far than their expectations. At Toms Tile and Grout Cleaning Yallambie, we follow step by step process which includes inspection of the area which could be your house or work space, to ensure the damaged section and how to work on it effectively with in your budget. For Tile Grout Cleaner and Tile Floor Cleaner we initially apply the alkaline based solution to emulsify and help in uplifting the greasy soils from the tiles. If you wanted to transform the look of your tiles and grout area, feel free to reach us out at Toms Tiles Cleaning Services for Floor Tile Cleaning, Pool Cleaning, Bathtub Cleaning and Grout Cleaning. 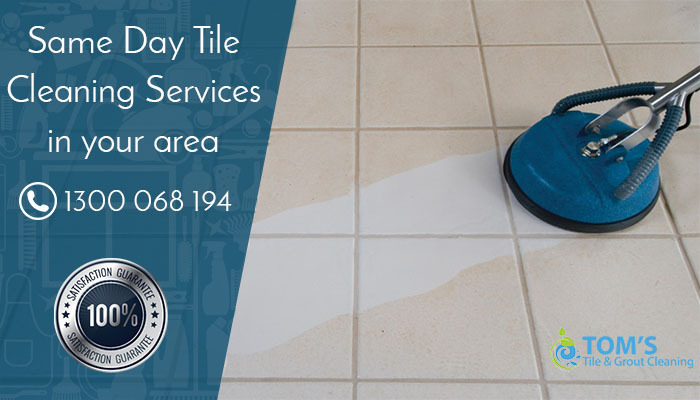 We are available for 24/7, if you have an emergency then we provide same day tile cleaning services in Melbourne and its suburbs. Just call us on 1300 068 194. Toms Tile and Grout Cleaning Yallambie is your local specialist for tile cleaning, stone cleaning, grout cleaning, tile stripping, tile sealing, tile regrouting, grout color sealing and covering the restoration of all types of stone and tiled flooring. Toms trained and experienced tile cleaners in Melbourne, Sydney & Brisbane can efficiently renew your tiles.